Newark An 8.3 level earthquake hit Chile in recent days. The quake lasted three minutes. 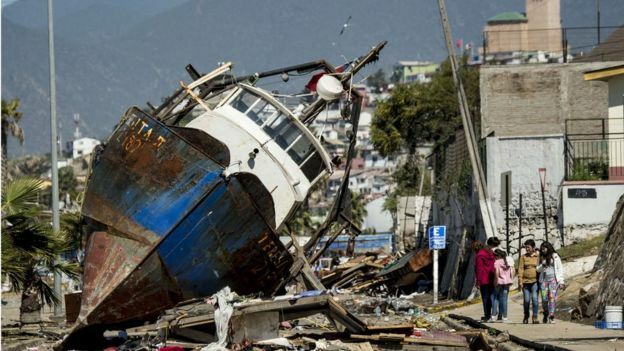 The tsunami carried boats from the port onto city streets along the coast. One million people were evacuated. Over 100,000 continue not to have electricity. Many are displaced. Amazingly, the death count has been relatively minor for such a tragedy with only eleven reported at this point. Many believe this may be due to progress in governmental response and the institution of tougher building codes since a 2010 earthquake killed over 500. Several years ago when the tsunami hit Japan the focus was huge, damage immense, and attention riveting. Many are just coming back to their homes three years later in the worst impacted areas. Nuclear plants are still under observation and the existence of the plants themselves and the threats of climate change are heated debates. In a global community what is the best response? Many will be moved to help, but families will feel special obligations whether it is Chile now, Japan then, Katrina ten years ago, or Aceh in Indonesia. Sending money costs money. Big money. Even the Economist in a recent editorial and article chided the lack of progress by the G-8 and World Bank on reducing the fees to the 5% cap that was supposed to have been achieved years ago. They claim the average is 7.5% but that figure has little credibility given how much it leaves out of the calculations. There are regular reports of technological breakthroughs and new competitors, but many institutions have raised their rates claiming the costs of money laundering and terrorism legislation requires more scrutiny. The Economist called for reductions across the board, and ACORN’s Remittance Justice Campaign has long made that demand. Can there be any better argument for reductions than disasters like Chile? A number of banks in Canada and the United States lowered or waived fees for transfers after the Japanese tsunami. Western Union and MoneyGram even said the right things for a bit. Where are they now? Many are joining in a call for Western Union particularly to lead the way by reducing the cost of transfers to Chile during this crisis and time of displacement. Any of us that can need to raise our voices now. ACORN and many other organizations have begun online petition drives among other tactics to get the message to the CEO of Western Union in Colorado to act now. Do whatever you can and sign the petition with us. How About a Better Deal for Philippines Disaster Relief from US Banks & MTOs? New Orleans The typhoon that devastated large parts of the Philippines, in a Hurricane Katrina like disaster many are seeing as part of what we can expect regularly in the future from climate change, is inspiring protests by poor countries at the UN Climate Change Conference and some corporate social responsibility, but, sadly nowhere near enough, especially in the United States. Some banks have stepped up to do the right thing and have waived all transfer fees, most for a month from mid-November until mid-December. There may be more on the honor roll, but from what I’ve found so far, it includes two banks in Canada, the BMO Bank of Montreal and the Royal Bank of Scotland, there and presumably elsewhere, Wells Fargo is the only bank in the US that has stepped up, and the Noor Islamic Bank in Dubai, United Arab Emirates. That’s all ACORN International has been able to locate. 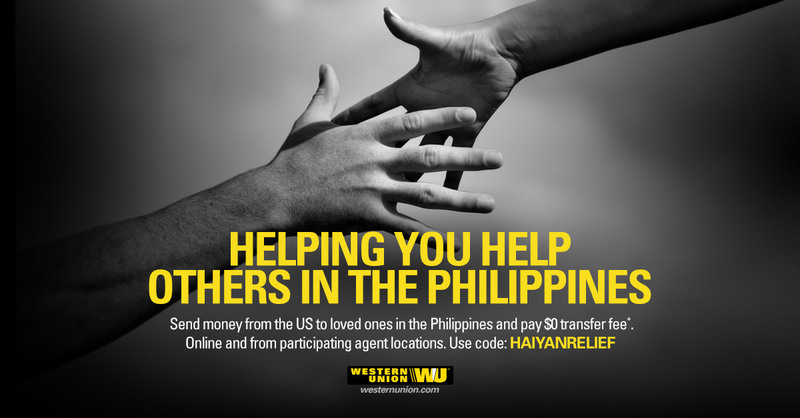 Of the scores of money transfer organizations, Western Union has been the surprising hero here, though with exceptions. In Canada, they are doing transfers to the Philippines for $1.00. Interestingly, the Western Union website in the US seems to have waived fees completely, though it’s a mystery to me why they are charging a loony in Canada and nada in the States. Regardless, cheers to them for doing what they are doing since MoneyGram, the other huge MTO, is charging $5 for a $100 transfer, which is hardly a bargain, and shows little heart in this crisis. But, what’s up with US-based banks? Why is Wells Fargo the only one of the big boys standing tall in the face of this tragedy? Where are Chase, Bank of America, Citi, and the rest? And, even more puzzling, especially in wake of the $1 charge by Western Union in Canada, are we starting to find out the real cost for these folks to do transfers? But, I digress. The important thing now is for all of us to ask our banks to waive all transfer fees to the Philippines so that there can be real resources and financial help for typhoon victims. Raise your voice for lowering the fees!